appeared on countless TV shows as and WITH Joan, herself. 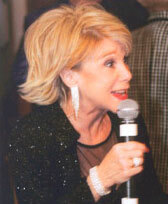 Eileen won the "Joan Rivers Look-A-Like" contest on the Joan Rivers Show and Joan has surprised Eileen on national television shows, such as Geraldo and Hardcopy, endorsing Eileen as her double. Eileen is available to appear as M.C.,"Joan Rivers" appearances at Corporate Events, Award shows, Theme Parties, and Bar & Bat Mitzvahs. She can also write and customize "special material" for your next Special Event and Comedy Roast. KTLA TV aired "Joan" and "George W. Bush" having cocktails at the Reel Awards...Laura Bush didn't know she had competition !!! I've worked other jobs this year but the most exciting event was flying to Washington D.C. for the AOL Corporate Christmas Party. I didn't want to look shabby so I wore a Bob Mackie original gown ...We've all seen Joan at the Awards ceremonies greeting celebrities, making a fuss over them and what they're wearing, well, that was ME with all the AOL VIP's! ...just like live TV, my TV crew frantically chasing me to televise my dishy comments and antics on big screens and in everyone's hotel suites just like the real "award shows." People told me they were laughing aloud, watching me on television from their hotel rooms as they were getting dressed for the event. I lost a few pounds that night greeting 6000 VIP's...but it was worth it, everyone had a ball and thought I was really Joan !!! AOL, PEPSI-COLA, EXXON OIL, CITY OF HOPE / WAYNE GRETSKY ROAST, CHICAGO TITLE INSURANCE, JOHN DEERE TRACTOR, REEL AWARDS, RON SMITH'S CELEBRITY AWARD SHOW, BROADWAY 'SPRING COLLECTION' FASHION SHOW, NEIMAN MARCUS "IN CIRCLE" SPECIAL EVENT, MACY'S "CUSTOMER APPRECIATION" SPECIAL EVENT, GODIVA CHOCOLATIER, ENTENMANN'S BAKERIES. VICKI! LAWRENCE Guest Star-Comedienne Nat Syn.